"Ladd High Room St. Patric's (sic) Day - 1896 We Never Say Fail!" Ladd (population 1,313) is located in north-central Illinois in the southeast portion of Bureau County. Ladd is located on Illinois Route 89 approximately 1 mile north Interstate Highway 80. Two railroad lines, the Burlington Northern & Sante Fe and the Illinois Railnet Inc., travel to and from Ladd. For a point of reference, Ladd is approximately 4 miles northwest of the LaSalle/Peru metropolitan area. The town of Ladd was incorporated in 1890. It began as a mining community in the late 1880s. The town was named after George Ladd, an early businessman of the village. The Ladd's population quickly grew and reached into the 2000s by the early 1920s. The mine closed, however, in 1924. This ended the time of growth for the village. Ladd has maintained its current population of approximately 1,300 residents for several years now. 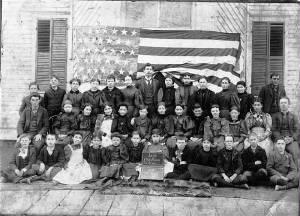 We first became aware that the Ladd school system offered high school courses through a photo on the web page of http://www.genealogytrails.com/ill/bureau/Villages/ladd/village.html . This was due to the excellent research conducted by Roberta VanBriesen. This page includes a photo of two school buildings, one of which is identified as "High School Ladd Illinois". An excellent history of the Ladd School system and Ladd High School was provided to us below by Jim Piacenti. "On April 30, 1864, the District No. 8 School was organized and a one room schoolhouse was built about a half mile north of present day Ladd. It was known as the Borger School because it was on land owned by Irwin Borger. In the spring of 1888, a sinking crew came to the area to sink a coal mine shaft. It took the crew a year and a half and six attempts at sinking a shaft but they were finally successful on December 31, 1889. Citizens of the Village voted to incorporate on June 7, 1890, and it was around this time the Borger School was moved to the present day school grounds. A two-story four room school building was also built on the school grounds at this time and a west wing was added to it shortly after that. It is the building on the right in this photo. High school classes were taught in one room of this wooden building. I have a photo of one of the "High Room" classes taken in front of this building in 1896. The brick building on the left was built in 1909 for $11,000.00. It was a two-story four room school that housed the the seventh and eighth grades along with a two year high school. The high school I believe was short lived with students going to Hall Township High School in Spring Valley when it was built in 1914. Classes continued in both of the Ladd school buildings. In the late 1930s as a WPA project the Ladd High School building was added onto and the wooden building was razed. I do believe that the High School was closed around 1914 even though I have yet to find a document that states the exact date that it closed. The reason I think that is because of the sources I used in writing the Ladd history book. I have those sources below. 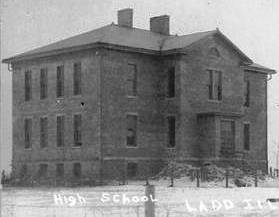 Also when I was researching for the Ladd history book I talked to some of the older residents of Ladd and no one remembered the Ladd High School. I think I would've been able to find someone that remembered it had it closed in the late 1930s or early 1940s. In the History of Ladd that was written in 1935 by the grade school students under the direction of Dan Burne Jones, it states that in 1908: "The men (Board of Education) decided to bond the district for the sum of $11,000.00 and the money was used to construct the present brick building which housed the seventh and eighth grades and the High school." The important thing here is that it states "housed" and not houses. The high school isn't mentioned again in that book. Although the grade school is mentioned quite a bit. The 1940 souvenir booklet from the 50th Anniversary doesn't mention the High School at all only that the present brick building was built after 1908 for $11,000.00. The 1965 souvenir booklet from the 75th Anniversary states that after the brick building was constructed in 1908: "The seventh and eighth grade pupils were transferred to the new structure, and a two year High School and Business Course was instituted and taught in the new brick building before Hall High School came into existence." If you have any further information regarding Ladd High School please contact us via the means listed at the bottom of this page. We believe that Ladd High School offered boys basketball, competing with other schools in the area and in the IHSA State Tournament. We believe it is possible that track and baseball were also a part of the sports program at Ladd High School. School team nicknmae, uniform colors, fight song, coach's names, team records, and other items would be a welcome addition to the Ladd High School page. We can imagine that the kids from Ladd had a very active time at Ladd High School. Dances, chorus, band, plays, and clubs were all likely a part of the LHS experience.